BeenThere-DoneThat: The City of Cambridge, Cambridgeshire. Clare College, Kings College Chapel and the River Cam. Cambridge is noted for two things; the university and bicycles. 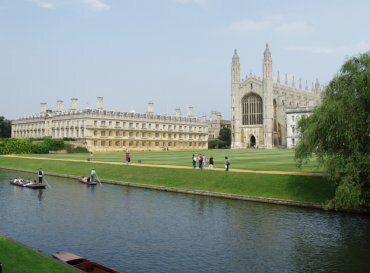 King's College, with it's famous chapel shown here standing on the right, is but one of the Medieval and Tudor colleges which make up the university. The building on the left is Clare College and the grassed area is part of the colleges' gardens known as the "Backs". Cambridge is relatively flat with only slight inclines and the streets in the city centre tend to be narrow so bicycles are very popular especially with students. You will see lots of bicycles and cyclists. There are only four round churches in England, discounting the ruined one in Ludlow Castle, and this is one of them and it is also the oldest. 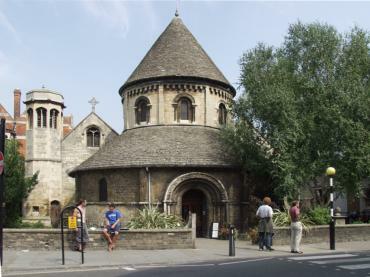 Situated at the junction of Bridge Street and Trinity Street this church has a 12th century aisled nave. The Crusaders built this church, on their return, as a copy of the original round church of the Holy Sepulchre in Jerusalem. Botolph Lane, one of the narrow back streets in the city centre, showing some of the inevitable bicycles. 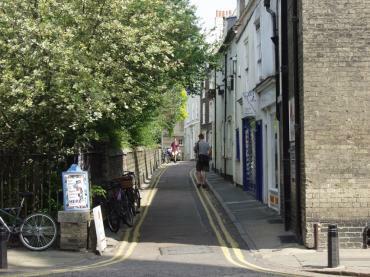 This little lane, which is opposite Silver Street where it joins Kings Parade, runs into Free School Lane. You can see why bicycles are a good mode of transport in this city. This is next to the Silver Street bridge seen at the back. There used to be a mill here but now the mill pond is used as a holding area for punts. 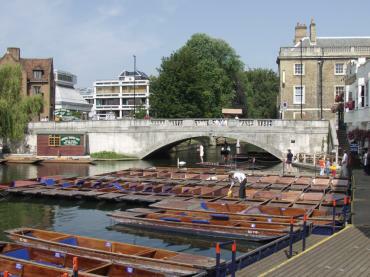 Punts can be hired here either with a 'driver' or on a do-it-yourself basis. There were a lot of punts on the river and at times it became quite chaotic usually attributable to 'self-drive' punters. It's not as easy as it might look but everyone seemed to be having a great time.